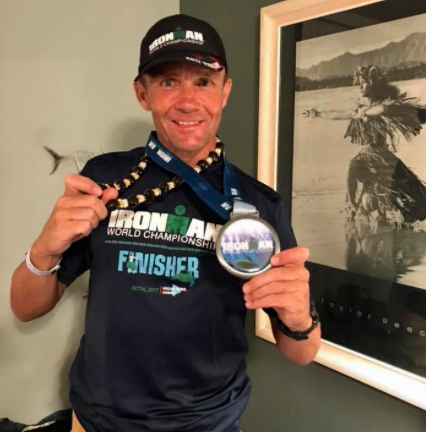 PLYMOUTH Tri Club’s Ken Holder and Tavistock Olympian Heather Fell both overcame tough conditions to complete the 2017 World Ironman Championships in Hawaii. In hot weather and on a difficult course in Kona, former modern pentathlete Fell finished 36th in the women’s 30-34 age group in a time of 11.01.56 hours. Her strengths were the swim and the run – both pentathlon events. She managed the 2.4-mile swim in 59.59 minutes, she then completed 112-mile cycle in 6:01.44 before finishing with a 3:50.07 marathon run. Fell had qualified for the Ironman World Championships after finishing second in her age category at the Standard Bank African Championships in 10:46.46. That was her ironman debut. Last month she claimed a top 10 age group finish at the Ironman 70.3 World Championships in America. Holder finished 139th out of 293 competitors in the men’s 45-49 category in Kona, clocking a time of 10:52.56. He completed the swim in 1:03.09 before enjoying a good cycle section, clocking 5:07.07. With conditions getting tougher, Holder then finished with a 4:34.05 marathon run. He had qualified for the World Championships after clocking 10:00.55 at the Weymouth Ironman.